One of my fondest memories of my mother was each morning during the potato harvest break in Maine. All the school kids got a 3 week “vacation” from school, but most of us ended up spending it picking potatoes. My mother used to make us a bowl of oatmeal with brown sugar each day as a breakfast recipe. 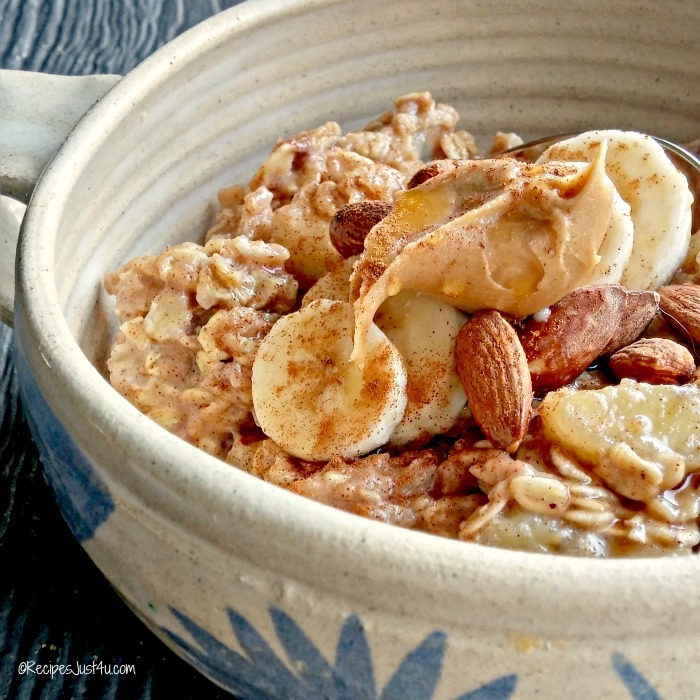 This hearty Bananas Foster Oatmeal Bowl is my version of it. I’m no longer picking potatoes but eating from this bowl takes me right back to those days. Another benefit? This is one of my 30 minute meals. 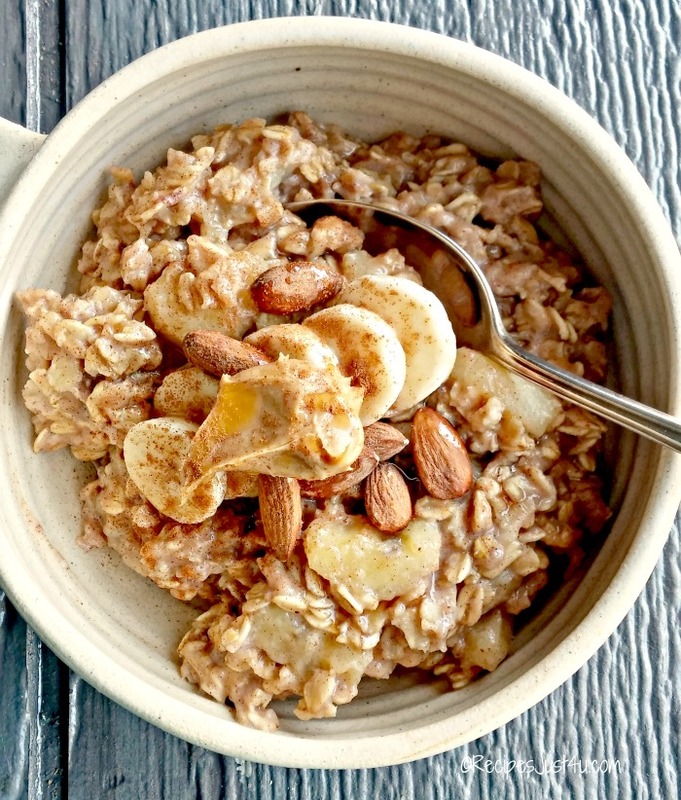 Start your morning with this tasty Bananas Foster Oatmeal Bowl. For me, oatmeal is a cold weather breakfast. I love the feeling of tucking into a steamy bowl of hearty oatmeal when the temps drop and I just want some comfort food. 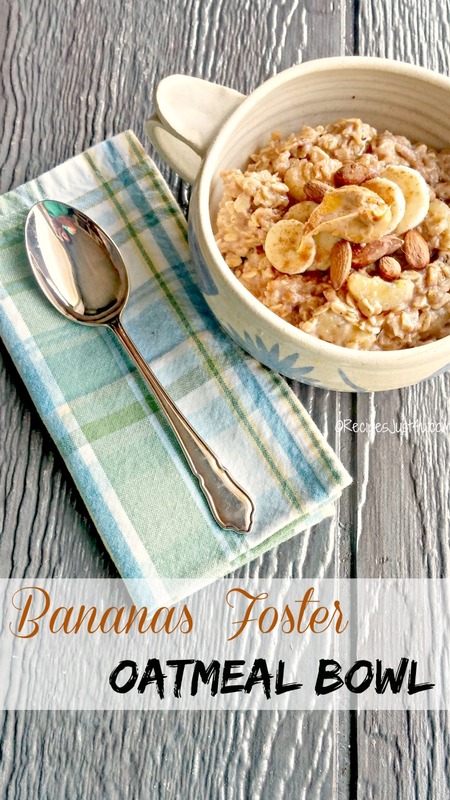 This decadent Bananas Foster Oatmeal Bowl combines hearty Old Fashioned whole grain oats, brown sugar, bananas, spices and peanut butter with skim milk. Don’t use quick cooking oatmeal. 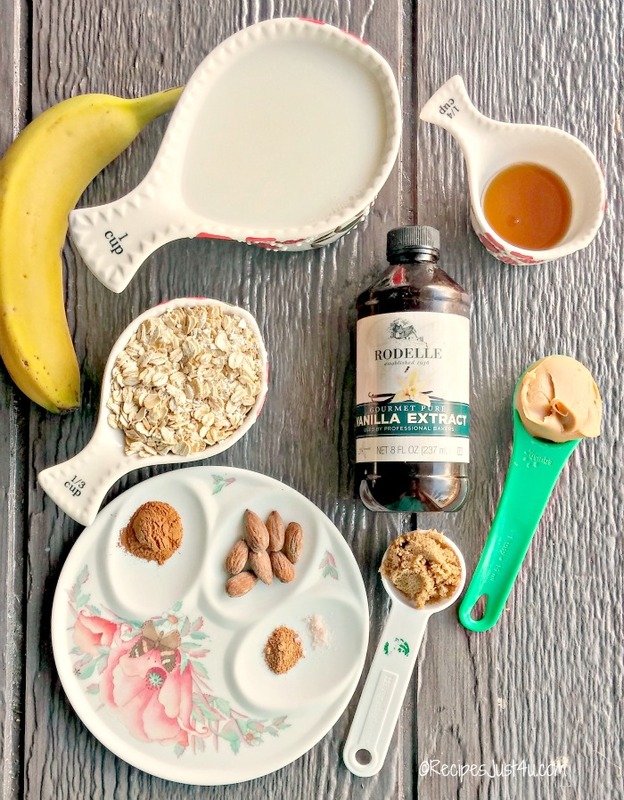 The old fashioned oats are needed for this recipe. It’s a super easy recipe to make and is ready in about 15 minutes. 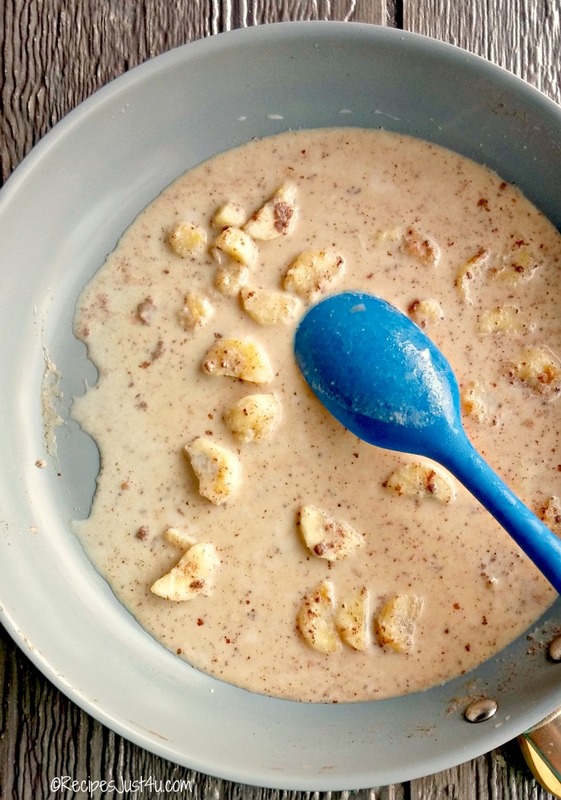 You start by cooking the bananas in some coconut oil, and then adding the spices, peanut butter and skim milk. Stir in the oatmeal next and bring to a boil and then reduce the heat to low and simmer for about 8 minutes. The mixture will be very thick when you are done. I love to add some hearty toppings to this bowl. Today I chose extra sliced bananas, a few almonds, a bit of pure maple syrup and a bit of extra cinnamon. 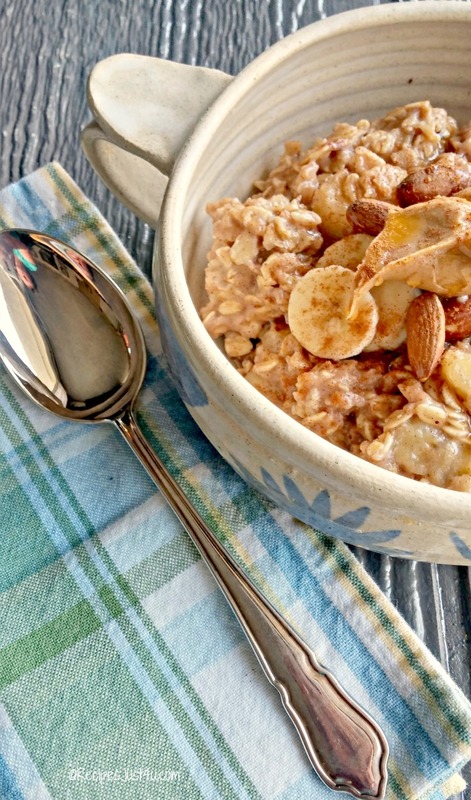 This Bananas Foster Oatmeal Bowl is so full of flavor. Seriously…it is the BEST tasting oatmeal I have every eaten. It is rich and hearty, not too sweet with the delicious taste of peanut butter and crunch from the almonds. It is a KEEPER! Now, off to enjoy my breakfast with some nostalgic memories of my mother serving us oatmeal in the morning (and being glad I do NOT have to go out in this cold and pick potatoes. For another great breakfast bowl that reminds me of my mother, try this chicken breakfast hash. Do you have an early memory that food brings back to you? Please share it in the comments section below! For more delicious breakfast ideas, check out this article on my Gardening Cook blog. Add the coconut oil to a saucepan and cook the sliced bananas for about 2 minutes. Stir in the peanut butter, skim milk and spices as well as the vanilla extract. 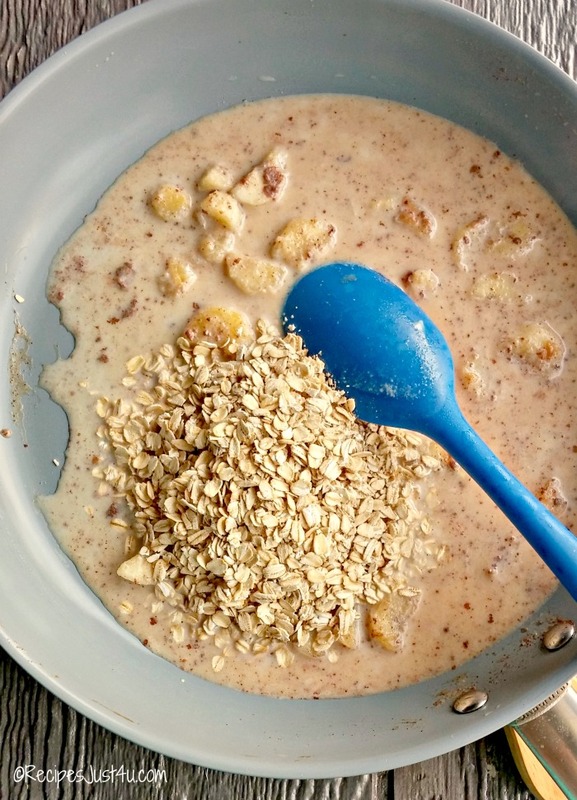 Combine to blend well and stir in the oatmeal. Bring to a boil, then reduce the heat to low and simmer for about 8 minutes until thick. Add some sliced bananas, a few whole almonds, a tsp of peanut butter, a pinch of cinnamon and then drizzle with a tsp of pure maple syrup. This is something my hubby would love! This looks really yummy! I have never had oatmeal with peanut butter in it, I bet it is more filling. I will have to try this. Thank you for sharing your recipe! It’s the first time I tried it too. It really was very filling. I was not hungry until 3 pm. It really is the best oatmeal I have ever made. So so tasty! This looks so yummy and decadent, especially good for asnow day like today! I have been cooking up an oatmeal storm lately!